Shelley Kerr has quit as Arsenal manager with the Gunners bottom of the Women's Super League. The former Scotland captain remains in charge for next week's FA Cup final against Everton though. Arsenal have lost three of their opening four games of the WSL campaign and are bottom with one point. Former Scotland international Kerr led her country to the finals of the 2010 Uefa Women's Under-19 Championship and helped her country reach the Women's Euro 2009 play-offs as a coach. "I've had a fantastic 16 months with Arsenal, but feel this is the right time to step aside," said Kerr in a statement. "I hope to bring my spell with Arsenal to a successful close on Sunday, with the defence of the FA Cup." A Champions League quarter-final defeat by WSL rivals Birmingham City added to the club's woe. Kerr refused to elaborate beyond the statement other than adding: "I have to prepare the girls for the Cup final and that's my only focus at the moment." The Gunners face Everton in the FA Cup final at Milton Keynes next Sunday aiming to keep the trophy they regained against Bristol Academy last year. It was the club's 12th FA Cup triumph, and they also won the Continental Cup for a third successive year. But after winning the top flight for nine straight seasons, Kerr's first campaign in charge saw them finish third. Another title already looks beyond them this year, while their Champions League exit has put them out of European football for the first time in a decade. Former manager Vic Akers, now director of football, is currently abroad on holiday and when contacted could shed no further light on the situation. A list of potential replacements will include ex-Arsenal captain Jayne Ludlow, who recently managed WSL2 Reading team to a shock Continental Cup win against the Gunners. One-time Charlton Athletic manager Keith Boanas, now in charge of Estonia's national women's team, could also be a candidate. And London based Hope Powell, dismissed as England manager last August, could be a surprise option for the position. 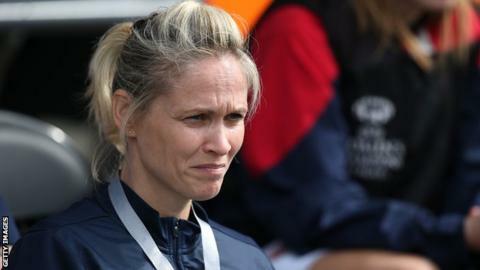 Veteran striker Kelly Smith, appointed assistant player-manager at the start of the season, is unlikely to be handed the role so early in her coaching career.